Sir,—Twice now Prof. Murphy has used a clipped quote from a poem of Tomás Rua Ó Suilleabháin to state that the poet wished to subject the Protestant community to ‘ethnic cleansing’ (Letters, HI 20.5, Sept./Oct. 2012, and HI 21.1, Jan./Feb. 2013). Prof. Murphy quotes the second-last line of the poem as evidence—‘go nglanfar cruinn as Éilge iad’. The third person pronoun here (‘iad’, ‘they’) does not refer to the Protestant community; it refers to, indeed can only refer to, the above noun, ‘ministers’. The poet hopes that the tithe-gathering agents and magistrates of a sectarian state will be destroyed. This last stanza leaves no room at all for imaginative interpretation. Nowhere in the poem is the Protestant community mentioned, let alone have destruction wished upon it. Throughout the poem the author very pointedly figures the ministers as parasitic tax-gatherers and inequitable law-enforcers. Prof. Murphy goes on to accuse the poet of a ‘visceral hatred’ of the Protestant religion and its adherents. Opposing the state-sponsored established church in the 1820s was not hatred of Protestants—indeed, Prof. Murphy could find many similar (and often stronger) denunciations of Anglican ministers in the works of the poet’s Presbyterian contemporaries (Thomas Ledlie Birch, Henry Montgomery, William Steel Dickson, etc.). Needless to say, a large portion of Irish Anglicans resented paying the tithe too (as did their English brethren, as the Swing riots of the 1830s show). Regarding Pastorini, we should not make the basic mistake of confusing the desire of a person to eviscerate a creed or ideology with a wish to physically exterminate its practitioners. No rational historian would claim that the Gordon Riots or the so-called Second Reformation were actual attempts to physically exterminate the Catholic population, despite what some rioters or overheated preachers may have said. Prof. Murphy further states that the word ‘emancipation’ in Gaelic poetry was ‘explosive’. If the word was explosive, it was only so to those ultras who adhered to the Duke of Cumberland and the Orange Order—those who did not wish to democratise a chronically discriminatory Irish polity. With a scattergun approach, Prof. Murphy references various Gaelic poets as ethnic-cleansing aficionados. Space does not permit a fuller reply—suffice it to say that reducing Ní Laoghaire’s long, complex and often contradictory political persona to that of a cardboard villain worthy of Richard Musgrave’s tome is reducing the actual to the absurd. Prof. Murphy prompts us to look at James S. Donnelly’s Captain Rock. 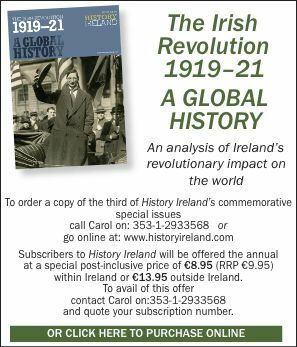 While there is much to commend in this work, it remains, as Seamus Deane and others have noted, fundamentally flawed, being too exclusionary and narrow in exposition. I would, however, urge Prof. Murphy to look at the ‘Threatening Letters’ papers in the National Archives, where the peasantry of the 1810s, 1820s and 1830s are allowed to speak for themselves without editorial excision. Here, in the peasantry’s own words, we see the complexities of Irish politics c. 1801–38, where Jacobinism and post-Bastille monarchism, advanced Whiggish thought and moral-economy Cobbettism, contract theory and post-Waterloo republicanism lie side by side—various ideologies not infrequently competing for supremacy within the one breast. The nineteenth-century Irish question was one of land and the super-exploitation of the mass of the population by a colonial power. It was not in any sense, other than superficial, a row over the finer points of transubstantiation, Mariology or the validity of sacerdotal absolution.